Sansthagat Bikas Sanjal is a networking non-governmental-organization (NGO) contributing to the development of local level NGOs based in different parts of Nepal. Sansthagat Bikas Sanjal is well known as ‘Sanjal’, which is a Nepali term for network. 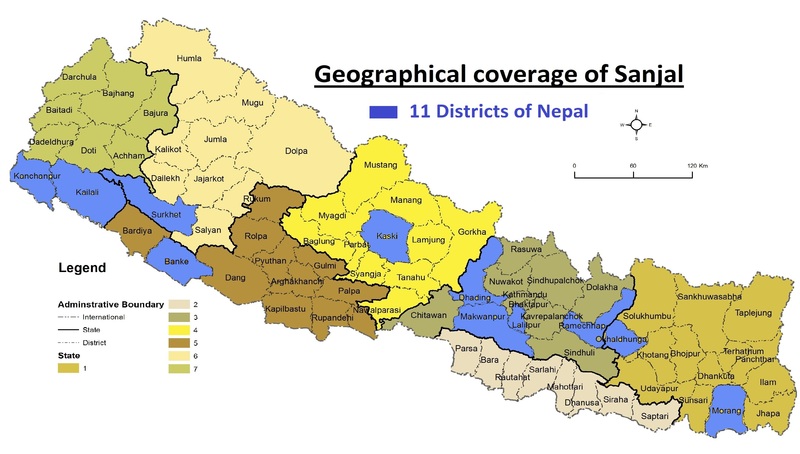 Sanjal works with 18 member organizations from 11 districts in far west, mid-west, central and eastern regions. These affiliates comprise of Community Based Networking Organizations (CBNO), Community Based Non-Governmental Organizations (CBO) and non-governmental organizations (NGO). Sanjal was established on April 2, 2007. Sanjal, since its initial day was envisioned as a common organization of the former UMN partners. It is the essence of Sanjal to work towards capacity development and performance enhancement of member organisations to achieve the collective goal of community prosperity. Sanjal was envisioned and established when UMN ended its work with several small, local-level organisations, leaving them without a strong partner. These organisations formed Sanjal to make a close network of support to strengthen each other as and when needed. A decade down the road, Sanjal is now established as an umbrella organization for all of its 18 members. Working together with all the affiliates, Sanjal has become a close family of all its affiliates, that is here to stay. During a decade of successful operation, Sanjal continues to develop stronger bonds and relationships between and among its 18 member organizations. Sanjal has become a companion for them in difficult times as well as supporter of their successes. Sanjal promotes organisational strengthening and the stability of its member organisations, that work with and for the highly-marginalised communities. Sanjal has bridged relationships between its members, donors and other stakeholders by helping them hit the right chords through capacity enhancement and organisational development. After a decade of Sanjal’s work, some of the member organizations have grown strong, while some need guidance and support. Sanjal strives to build the capacity and performance of its member organizations. It has been contributing to the development of organizational strengths, stability and resilience of its affiliates. For strengthened capacities of its partners, Sanjal supports and facilitates for organizational capacity development, financial supports in the form of projects for enhancing their project management capacity and making them sustainable. It also facilitates in donor linkages, establishing partnerships as well as advocacy for the rights of marginalized communities. Sanjal only works for and through its member organizations for the benefits of highly marginalized groups, endangered ethnic indigenous minority groups, women and Janjatis in their respective constituencies. Sansthagat Bikas Sanjal has adopted indirective approach for organizational development which is based on conscientization and realisation of needs by self for change and community organization. Demand driven approach is in the heart of all the activities carried out by Sanjal for its member organizations as well as communities. Sanjal is actively involved in thematic areas such as organisational development, capacity building, peace building, rural education, food security, health and sanitation, HIV/AIDS awareness raising, and disaster response and reconstruction. Such thematic areas are covered by a number of projects. The ultimate objective of Sanjal is to make all of its member organisations capable enough to cater to the needs of marginalised communities.